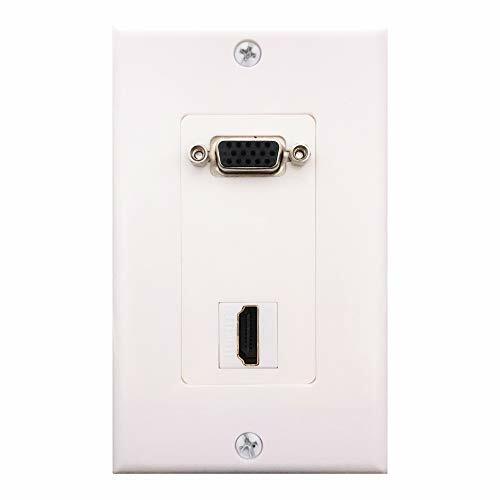 Features:1.Connection A: 2 x VGA Female Port2.Connection B: 3.5mm Stereo Female Port3.This white wall plate insert is designed for HD15 and 3.5mm female couplers.Tips:If you need different type Wall Plates or Wall Insert Adapters(USB2.0,USB3.0,RCA,XLR,HDMI,VGA,RJ45,DC3.5,),you can search " Lemeng Wall Plate", "Lemeng Wall Adapter", "Cerrxian Wall Plate" or "Cerrxian Wall Adapter".There are so many different types there will be one that you will find amazing.What's more,if you have any other questions or concerns, feel free to contact us.We are always pleased to serve you at any time. 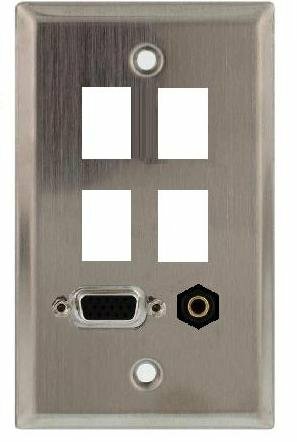 Single gang brushed stainless steel wall plate for use with an audio/ video system. Includes VGA feed-thru jacks and four keystone jack cut-outs. The feed-thru jack is identical on the front side of the plate as well as the back, which makes for fast and easy installations. The keystone jack cut-outs are industry standard size and shape permitting just about any conceivable connector combination. Just add the connector of your choice. The plate is standard single gang size. Durable and easy to clean. 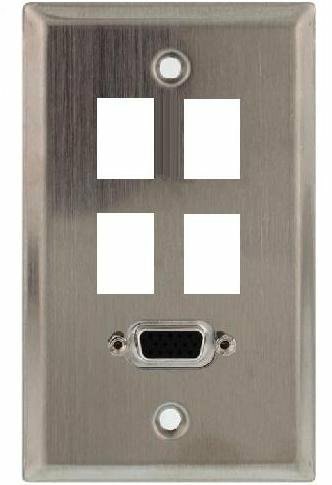 Single gang brushed stainless steel wall plate for use with an audio/ video system. Includes HDMI, VGA and 3.5mm feed-thru jacks and two keystone jack cutouts. The feed-thru jacks are identical on the front side of the plate as well as the back, which makes for fast and easy installations. The keystone jack cut-outs are industry standard size and shape permitting just about any conceivable connector combination. 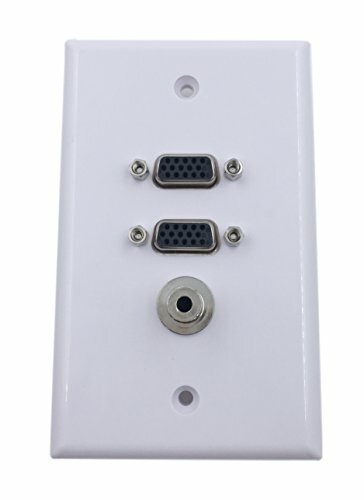 Just add the connector of your choice. The plate is standard single gang size. Durable and easy to clean. 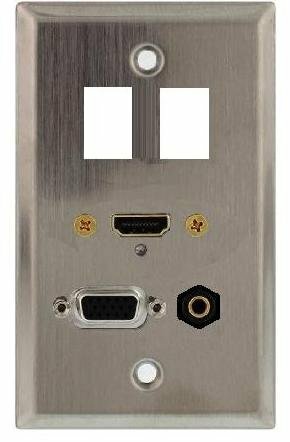 Single gang brushed stainless steel wall plate for use with an audio/ video system. 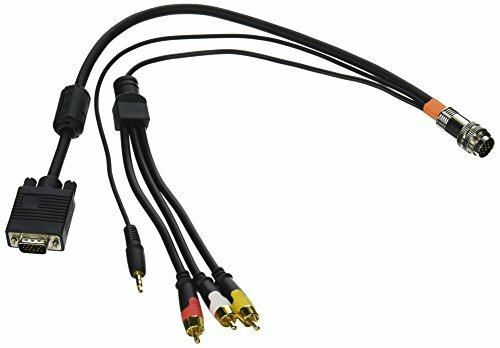 Includes VGA and 3.5mm feed-thru jacks and four keystone jack cutouts. The feed-thru jacks are identical on the front side of the plate as well as the back, which makes for fast and easy installations. The keystone jack cut-outs are industry standard size and shape permitting just about any conceivable connector combination. Just add the connector of your choice. The plate is standard single gang size. Durable and easy to clean. Add the finishing touch to your installation with a decorative feed-through wall plate. Designed to mount in standard electrical boxes or mud rings, this wall plate is constructed from 3mm aircraft-grade brushed aluminum to withstand demanding commercial environments. 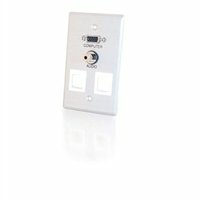 The feed-through connectors and engraved identification markings makes this wall plate simple to install and easy to use. 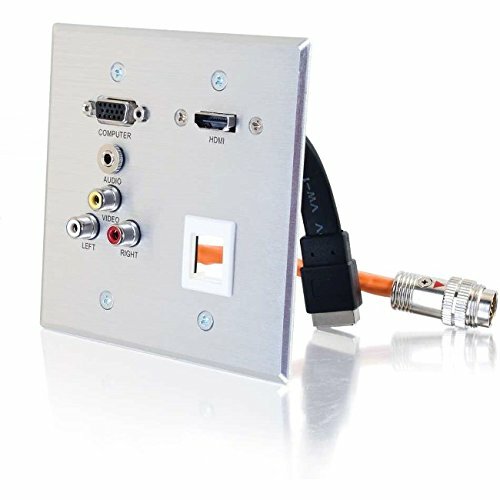 Compatible with new or existing wiring networks, this single gang design offers an HD15 jack, 3.5mm stereo audio jack and two keystone bezels, all in one wall plate. Universal and compatible with any wiring. The feed-through connectors are designed to offer low-loss signal transfer and maximum insertions for a lifetime of service. Keystone bezels provide added flexibility for data and networking support. Mounting hardware included. 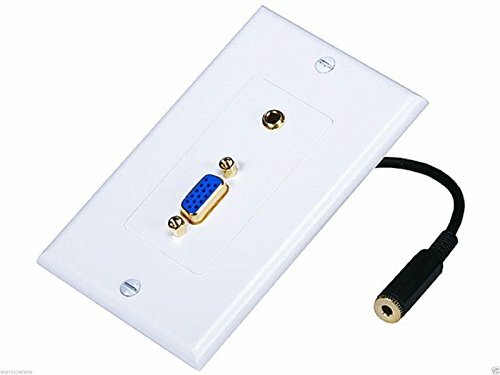 Looking for more Hd15 Wall Plate similar ideas? Try to explore these searches: Bouquet Stand, Other Waterway Jets, and Bmw Servotronic Steering. Look at latest related video about Hd15 Wall Plate. Shopwizion.com is the smartest way for online shopping: compare prices of leading online shops for best deals around the web. Don't miss TOP Hd15 Wall Plate deals, updated daily.